The Consumerist printed a letter from a reader, Grant, who claims his Xbox Live gamertag, "theGAYERgamer," was banned from Xbox Live. When he called Microsoft customer support, a rep reportedly told him that while she wasn't offended by his gamertag, "the greater Xbox community" had found his it offensive, thereby warranting a ban. Hit the jump for Grant's full letter to The Consumerist and for comment from Microsoft reps. I have had a bad morning. 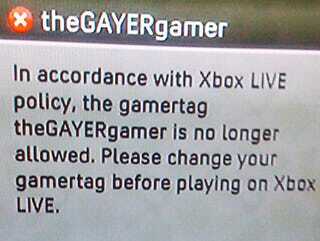 Last night when i tried to sign into my xbox live account "thegayergamer" I was told that it had to be changed. I figured that it was just from people reporting it as an offensive name being that the greater Xbox live community isn't exactly welcome to gay people, i spend a lot of time muting people on Halo3. I assumed that once i called Microsoft they would straighten things out. We recieved a complaint on the Gamertag and determined that it did indeed contain sexual innuendo. Now granted, there could be an argument that the text is not pejorative to homosexuality and should therefore be allowed. But there is no context to explain that. Gamertags are visible to everyone and it would be hard for me to defend to a parent of a young child who saw it that the name did not contain content of a sexual nature. Toulouse clarifies that "yes 'TheStraighterGamer' or 'TheHeterosexualgamer' would have gotten the same treatment and would have been found to be in violation and forced to be changed," adding that gamertags along those lines have been banned in the past. The entire post is definitely worth a full read. What do Kotaku readers think? Is this an extension of what many people discuss as a culture of intolerance on Xbox Live? Should users be able to express themselves on Live in any way they see fit? Or does sexuality simply not belong in gamertags, regardless of orientation?